My twelfth ground of 2016 was on Tuesday 16th August at the Raymond McEnhill Stadium in Salisbury, Wiltshire. The match was Salisbury vs. Bishop's Cleeve in the Southern League Division One South & West. 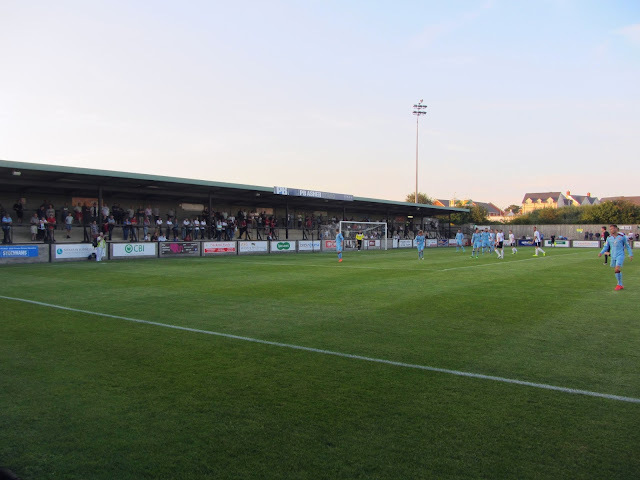 The Raymond McEnhill Stadium is located in the Old Sarum area of Salisbury on the northern fringe of the city. Initially isolated the ground is now nestled within new housing developments and is also just north of the Old Sarum Airfield. It is around 3 miles from the centre of Salisbury where the city's railway station can be found. The venue has been home to Salisbury and its previous incarnation of Salisbury City since 1997. The area opposite the main stand is a thin uncovered concrete terrace of 4 rows. In 2007 two small stands of 74 seats each were added to the middle of this side of the ground to meet grading requirements for the 5th tier. Similarly the south-east end of the ground is uncovered. The north-west end of the ground houses a sizeable concrete terrace 11 rows deep which runs the length of the area behind the goal and is popular with home fans. Salisbury got off to the perfect start when they opened the scoring the 4th minute. An excellent Lewis Benson through ball from midfield allowed Tommy Wright to run on and slide past the keeper from the edge of the box. Wright came very close to adding a second in the 27th minute when he skipped inside a tackle in the box and his shot came back off the woodwork. A few minutes later the hosts did go 2-0 in front when a cross into the box was nodded on and expertly headed into the top corner by Justin Bennett. Wright, however, was continuing to be a menace and in the 53rd minute came close again when he dispossessed a dithering defender to go clean through only to see Steve Benbow in the away goal deny him. In the 61st minute Salisbury extended their lead to three - a corner into the box caused a scramble and with the ball bouncing around Christian Oxlade-Chamberlain reacted quickest to poke the ball over the line. Bishop's Cleeve did pull one back shortly after this when the ball was laid off to Mark Magee some 20 yards out and his fierce shot was palmed into the net by Salisbury keeper Alex Bass. The last word went to the home side in the 75th minute when a risky defensive header across the area saw the ball fall to Justin Bennett who controlled it before curling into the top corner from 20 yards out.